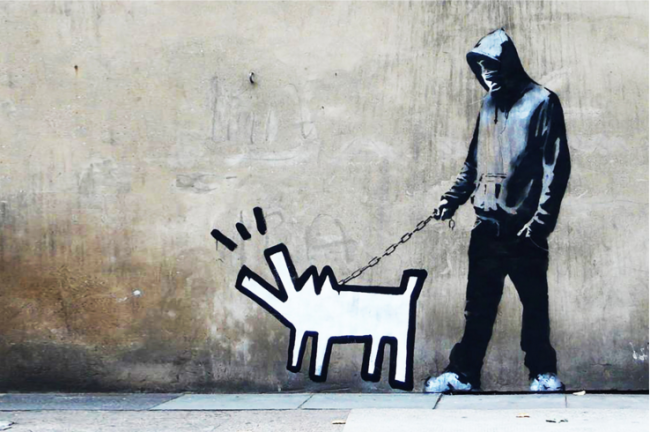 “There are crimes that become innocent and even glorious through their splendour, number and excess.” – Banksy. Combining striking images with thought provoking slogans onto walls of the streets for the public to see, its no wonder graffiti artist, Banksy, continues to gain acclaim with his artwork throughout London and other major cities around the world. While managing to remain anonymous, he regularly leaves impacting messages on political themes, satirically critiquing war, capitalism, hypocrisy and greed. He has even been listed world’s 100 most influential people in 2010 by Time Magazine. Banksy’s ‘Choose Your Weapon’ is one of the artists’ least discussed works since very little is known about the piece. While we know the location Banksy’s ‘Choose Your Weapon’ first appeared-London’s Southwark District- the artwork appears to be one of his more mysterious works. The dog in this piece pays tribute to Keith Haring’s iconic “Barking Dog,” appearing in an all white silhouette. The dog’s walker wears a hooded sweatshirt with a bandana disguise, possibly representing disgruntled youth which features prominently in British pop culture. The stark contrast between the man and his dog is the most striking contradiction in this art piece. The dog is held by chain, becoming the young man’s weapon. Rather than a weapon such as a knife or firearm, this young man’s weapon is “man’s best friend”, which is portrayed minimally and in dramatic disparity to the painting technique used on the young man. For Banksy, his weapon is his street art. Banksy has become one of the most popular contemporary artists. As Banksy has maintained his shroud of anonymity, his real prints have become a global commodity. His canvas art has been sold to some of the most elite in the world and his stencil icons are used or copied in advertising, fashion and trend forecast blogs. 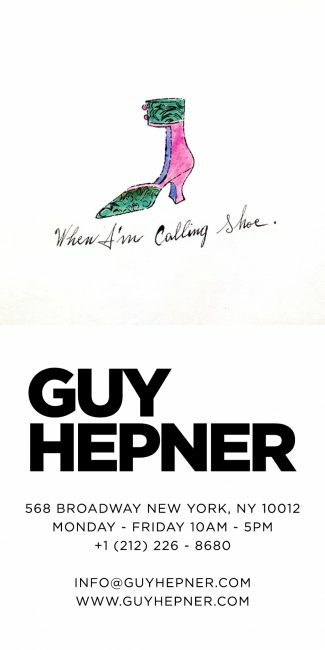 Guy Hepner Contemporary Art Gallery in New York City is pleased to present the sale of Banksy artwork, canvas, paintings, and a wide range of ‘Choose Your Weapon’ prints and Kate Moss prints. 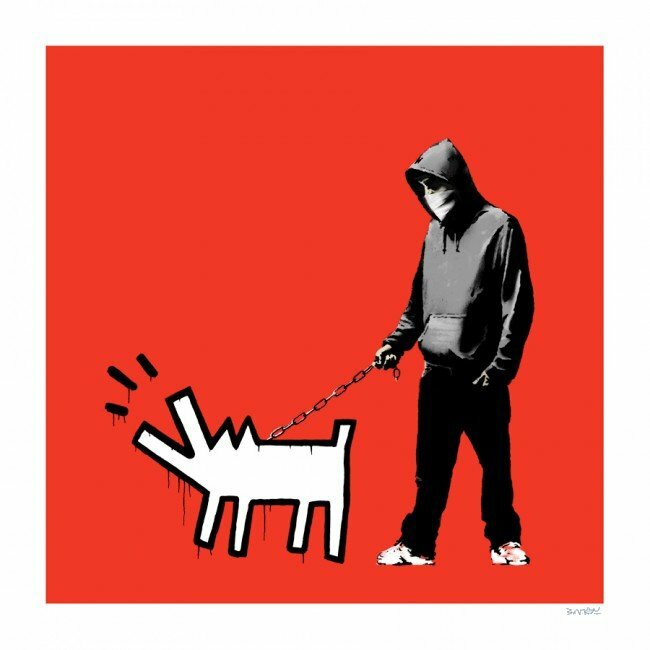 Inquire about prices to buy Banksy art for sale.